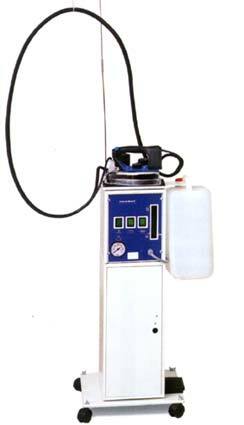 The GL - Pro - Extra is a 5 Litre steam generator made for: Large Design Rooms, busy ironing services, alteration shops & clothing manufactures, etc. This Extra version is fitted with an industrial water pump and an external cold water reservoir. At the push of a switch the pump takes water for the reservoir and fills the steam pressure chamber. When you are using the GL-Pro-Extra you can fill and top up the chamber when necessary, with-out turning it off or letting it cool down. This saves time and means you can continue to iron without delay. As with the other GL-Pro steam generators this Extra model requires no special installation, its very easy to operate, uses standard tap water & is powered by a standard 13 amp plug. Full length industrial cabinet with castors. Built-in electric water pump & external cold water reservoir, so you can top-up & fill the heating chamber with-out turning it off & letting it cool first. Saving you time. Large 5 litre stainless steel heating chamber, for improved durability. Brass plated heating element mounted in the middle of the steam chamber. Built-in illuminated water level gauge, so you can see how much water is left. Safety pressure regulator & thermostat fitted. User adjustable solenoid valve, allowing you to control & set the flow of steam. Built-in high temperature silicon iron rest. Top mounted, pressure locking, filler cap: so you can also manually add water. Blow down / service drain tap: Normally only found on much larger generators and fitted to improve the units serviceable life. Element port, for servicing & inspection. Supplied complete with a long base industrial steam iron with thermostat & thermal safety fuse.